The Airsoft GI Custom Classic Army PXG 9 OMEGA is equipped with aesthetically pleasing parts to further make this model a unique SMG! This model features a 7" Madbull Daniel Defense Omega X RIS for maximum utilization of accessories you want to attach. There are numbers labeled on the rail to remember your different accessory setups for the SMG. Toward the front, a black metal Jag Arms 249 Flash Hider flushes amazingly with the rail. Additionally, a short foregrip is included for better weapon manipulation when you are dashing around the CQB terrain. The PXG 9 is perfect for players who like to play CQB. With a short profile and skinny magazines, it is easy to keep weight down and maintain ammo superiority on the field. 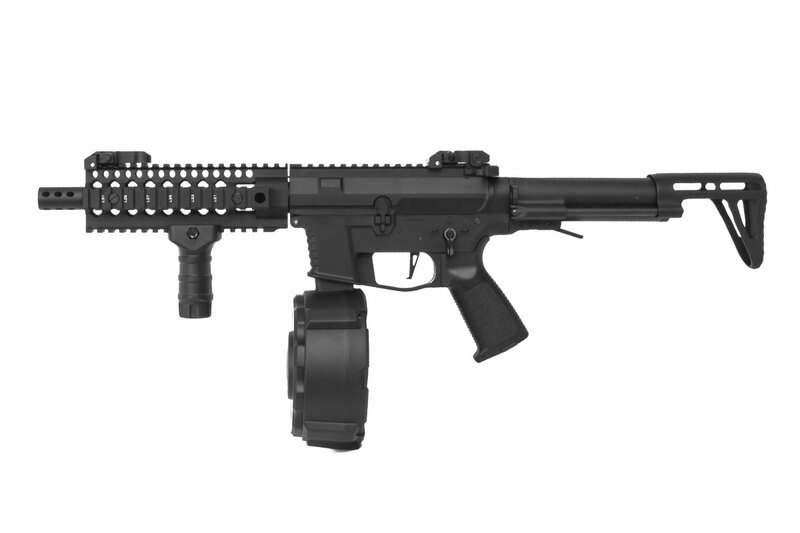 The PDW stock this gun has attached includes more than enough room for even the most powerful of batteries so that you can harness the power of it's ECS trigger system. Familiar controls mimic what you would find on an M4, so that you don't have to change the way you operate your airsoft gun. Internally, the PXG9 features many of the same features as it's full-metal cousin. 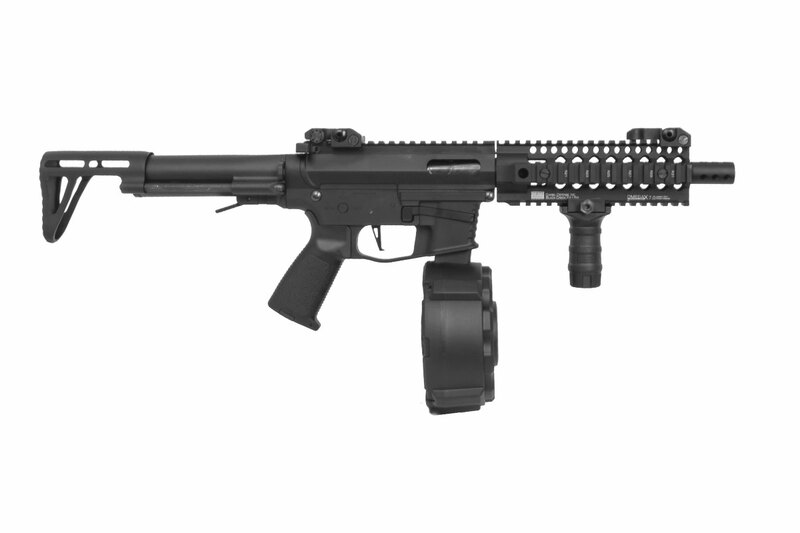 This includes the ECS Trigger system, which gives you programmable fire control settings, meaning you can access burst fire modes, turn off full auto and go semi only, or open it up in full auto quickly and efficiently through pulls of the trigger. No computer or bluetooth required! The insides of this gun also feature a tight bore barrel for excellent range. This means the PXG9 is more than capable of medium range gameplay, laying down accurate fire to hit targets at distance, or keep heads down while you become the ultimate aggressor. 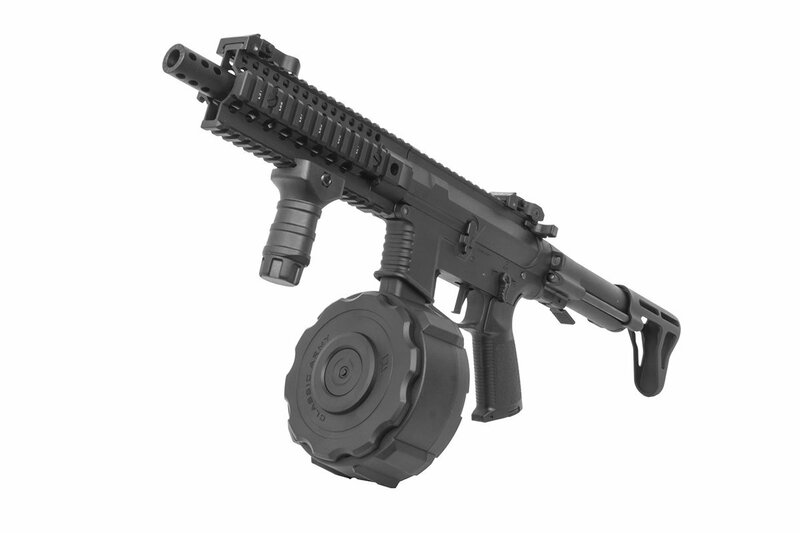 This package deal also includes the auto winding X9 drum magazine. This 1200 round drum is the perfect fit for turning this gun into a pocket LMG. It's lightweight, easy to insert and remove, and doesn't take up space the way bulky box magazines for larger guns tend to do. Never worry about running out of ammunition again! 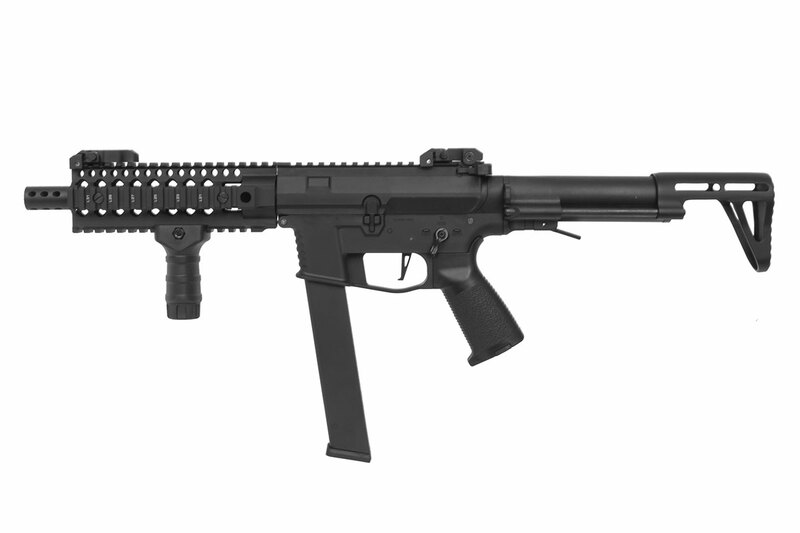 The Airsoft GI Custom Classic Army PXG 9 OMEGA Airsoft SMG is for enthusiasts looking for an awesome prebuilt airsoft gun. This is the perfect choice for those wanting to take on the battle with an extraordinary SMG within their arsenal.